“Public Education” is on the lips of every politician, during every election cycle. Yet, the debate continues. It is doing well, it is doing poorly, it needs reform, whatever the narrative needs to be that day or what the audience wants to hear. Well, there are three sides to every story: “Yours, mine, and the cold, hard truth,” like the old Don Henley song reminds us. Out of the roughly 55.5 million K-12 students in America, 49.5 million of them are in our public schools, which is a little over 89%. If you visit a public education classroom today, you would be amazed at what our educators do on a daily basis. We must remind ourselves we are not producing components for an industrial and societal machine. We are educating children. We can all agree that an engaging and challenging education is the proven path to prosperity and a life-long love of learning. Teachers consistently tell us that “testing” and “preparing students for a test” are among their top concerns in our internal surveys. It has long been acknowledged that a strong public educational system is essential not only to the successful functioning of a democracy, but also to its future. That system must provide all children with an equitable and exceptional education that prepares them for college, career and life. Educators, themselves, must exercise a higher duty of care than most professionals. Teachers face exposure to liability much greater than does the average citizen. Nearly every day, teachers must deal with diverse laws related to issues such as child abuse, student discipline, negligence, defamation, student records and copyright infringement. And many politicians are more concerned with a test score that their children produce than the immeasurable impact that teachers may make on a child’s life. Often educators must contend with the fact that students do not have a consistent source of high-quality, nutritious food, if they have food at all at home. Issues like hunger and poverty, like it or not, are not imagined and they are prevalent in classrooms and schools across the nation. According to the United States Department of Agriculture (USDA), 15.3 million children under 18 in the United States live in households where they are unable to consistently access enough nutritious food necessary for a healthy life. These 8 states have statistically higher food insecurity rates than the US national average (14.6%): Arkansas (21.2%), Mississippi (21.1%), Texas (18.0%), Tennessee (17.4%), North Carolina (17.3%), Missouri (16.9%), Georgia (16.6%), and Ohio (16.0%). More than 1 in 5 children is at risk of hunger. Among African-Americans and Latinos, it’s 1 in 3 according to the USDA. It is hard to focus on education when you are hungry. Poverty and hunger also lead to other health issues, which also go untreated. What other profession besides public education teacher is evaluated on their students’ test scores, when students lack the basic necessities of life? Steve Turner in his brilliant satirical poem “Creed” referenced the state of our culture, when he wrote prevailing illogical thought processes: “This is the fault of society. Society is the fault of conditions. Conditions are the fault of society.” Seemingly educators bear the brunt of the outcomes of children, and society is a given a pass. The problems we confront are larger than the children walking through the school house door. The solutions are more than a score on a test. So, when the next politician speaks about education when seeking your vote, ask them what their plans are to alleviate poverty and hunger in your community. That is much more important than test scores to a whole lot of families. Today, we welcome Senator Steve Dickerson to the blog. Steve Dickerson is currently running for state senate in District 20 against Erin Coleman. You can read Erin Coleman’s interview here. Can you tell us a little about yourself and why you are running for office? I am an anesthesiologist and father of three. My wife and I have lived in Nashville for 20 years. 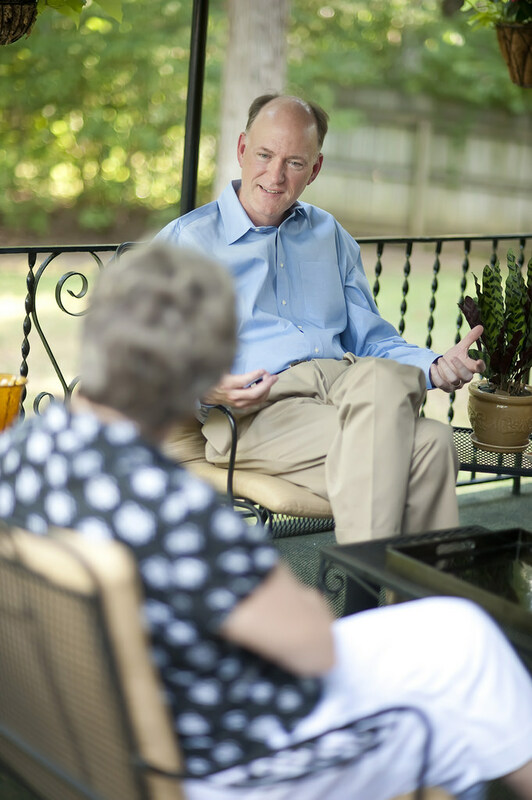 I am running for re-election to continue to expand prospects for Tennesseans to live the American dream. I believe this is accomplished by creating an environment that fosters economic development, enhances educational opportunity and provides government services in an efficient and cost-effective manner. As a city and state, we have made great strides over my first term but there will always be room for improvement. Our best days are ahead of us. What role should the legislature and the state play in the education system? There is a dynamic relationship between local school boards, local governments, the General Assembly and the federal government. Overall, the General Assembly has a role in aligning curricula with workforce needs; funding and setting overall state standards. There will always be some tension between all of those stakeholders so it is important to have representatives who understand this, will try to build consensus and advocate for good policy. What is one thing that the state is doing well in regards to the education system? I think the best thing we have done is to continue to discuss the importance of education. While virtually everyone would agree as to the key role education plays, over the last several years we have really re-focused on education’s essential contribution to the future of our city and state. As far as specific, tangible policy, the state has increased funding at an unprecedented rate without increasing taxes. What is one thing that the state is doing that needs to be changed or improved? I believe there is widespread “over-testing.” Recently, the state decreased requirements for standardized testing. While this is a good start, I think we need to continue to look for ways to decrease the volume of testing and the reliance on “high stakes” testing. This process involves LEAs, school boards and the General Assembly and is one of our areas where we all need to work together. I have toured dozens of MNPS schools over my term and the burden of testing and test-preparation has been the most common concern voiced by teachers. If reelected, what education policies will you advocate for at the legislature? I will support a more nuanced agenda of educational reform. Six years ago, when Governor Haslam took office, there was universal concern over our state’s performance on national tests. As a result, our state undertook an aggressive reform package. Now, it is time to take stock of where we are and how to get where we need to be. I view this somewhat from my perspective as a physician. If a patient is in critical condition, one needs to be aggressive. But, once the patient is stabilized, a more long-term, balanced approach is required. I believe we are at that point in our current wave of education reform. In my first term, I sponsored numerous education bills. Two of note were the “Quality Pre-K Act” and the “Charter Accountability Act.” I will continue to seek these same sort of policies that look for data-driven solutions that are supported by advocates all across the spectrum. How will you support Metro Nashville Public Schools as a state senator? I have enjoyed a very solid relationship with MNPS over my first term and expect that it will only grow stronger over the next four years. There are three specific actions I will pursue on behalf of MNPS. First, I will be an advocate for MNPS in and out of the General Assembly. I am proud of the work we are doing in Nashville and will make sure everyone knows it. Second, I will continue to sponsor bills on behalf of MNPS. Third, I will continue to look for ways to enhance funding. MNPS has one of the most diverse student populations in the state. This is a strength that adds vibrancy to our city but also entails additional costs. Thank you for your time. Is there anything else you would like to add? Where can readers go to find more about your campaign? Today, we welcome Erin Coleman to the blog. Erin Coleman is currently running for state senate in District 20 against Senator Steve Dickerson. You can read Steve Dickerson’s interview here. I am a mother of three young children, a small-business owner, an attorney, and a U.S. Army veteran. Currently, there are no mothers of young children in the Tennessee Senate, and that viewpoint is sorely lacking. The state legislature has gotten sidetracked on wedge issues and bad behavior. The only way to change the culture of the state legislature is to change who serves in the state legislature. Senate District 20 deserves a senator that will put Nashville first. Let us decide issues and stop the state legislature from overriding our wishes every chance they get. The state legislature plays a huge role in funding education, in approving textbooks, in curriculum oversight,and in setting teaching licensure standards. In terms of funding, the state must get the BEP right and ensure that our large urban systems are getting the funding they need, especially for ELL. On the other issues, the legislature should work to ensure that the state is a productive partner with local officials. The state shouldn’t simply dictate to LEA’s. For example, the state should not have the authority to override local decisions on which charter schools are approved and which are not. Local officials are on the ground and know better than the state what is best for their districts. The state has two primary responsibilities- funding and assessment – and it is doing neither well. Prior to 2011, Tennessee was a national leader in education reform. Due to a lack of leadership, the state has since thrown that away. The responsibility for this failure falls most heavily on the members of the legislature’s Education Committees. They have led the race to the bottom in education in Tennessee. The state should not have the authority to override local decisions on charter schools. Charters have a valuable place in our education system, and locals know best what that place is. We should let our elected school boards do their jobs and keep the state out of it. If elected, what education policies will you advocate for at the legislature? Getting the BEP right. In order to thrive, school systems need financial resources. Nashville has a tremendous need for ELL funding. That must be taken into account in the BEP. I will also work to further expand Pre-K. There is no single education investment that can have as much of an impact as quality Pre-K.
Over the past year, I have developed strong relationships with our MNPS Board members. I will meet with them regularly to determine their needs and how best I can help them in the Senate. I will also keep an open door for any parent, student, teacher, administrator, or school staffer that wants to talk to me. As a mom to three young children, I know how important a quality education is. In fact, I believe that educating our children is the single most-important thing our government does. 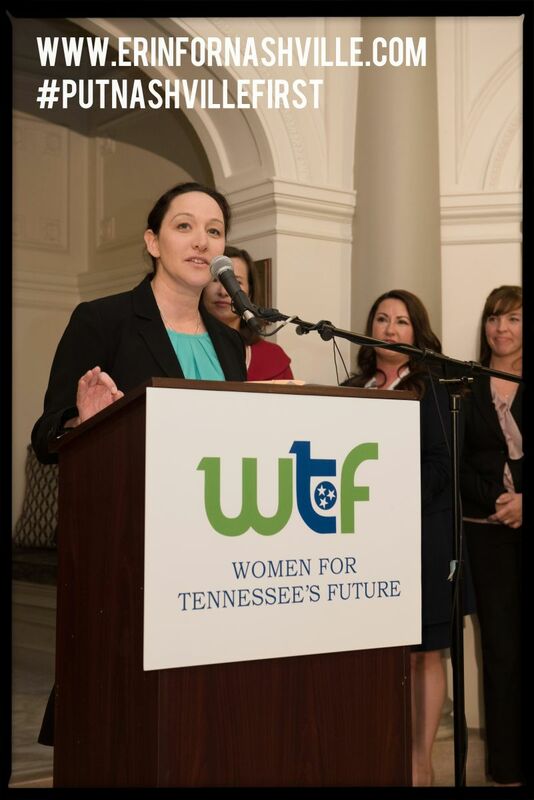 Visit erinfornashville.com or facebook.com/erinfornashville or twitter.com/ErinCforSD20 for the latest information about my campaign. This election presents a contrast between two distinct visions of what Nashville and Tennessee should be. I believe that our public education system is an essential building block in our community and it should be fully funded and supported. Our state legislature works to undercut public education at every turn. Unless we change who serves in the General Assembly, that will continue. Joel Ebert and Dave Boucher of The Tennessean reported this weekend on a beach vacation for five Tennessee lawmakers hosted by a prominent school voucher advocate. The Oscar winner inspired a spirited discussion among the men on the trip, who were hosted by voucher advocate Mark Gill, about leadership and integrity. Reps. Andy Holt, Mike Carter, Billy Spivey and recently ousted lawmakerJeremy Durham stayed at Gill’s condo and left one morning for a half-day deep sea fishing trip paid for by Gill. They didn’t catch many fish, but the captain showed them how to filet the ones they did. Rep. Jimmy Matlock also made the trip but went to the beach instead of fishing because he gets seasick. Interestingly, the lawmakers who took the vacation at the voucher advocate’s beach house all supported and co-sponsored voucher legislation in subsequent legislative sessions. The “odd duck” Carter referenced is Gill, a member of the board of directors with the Tennessee Federation for Children, an arm of the American Federation for Children that spends hundreds of thousands of dollars each year on contract lobbyists to push lawmakers to legalize school vouchers in Tennessee. In 2016, all five lawmakers who went to Gill’s condo co-sponsored legislation to allow vouchers in the state. So, Mark Gill serves on the Board of Directors for the Tennessee Federation for Children, is a large donor to the group, and hosts five Tennessee lawmakers at his beachside condo and then those same lawmakers just happen to co-sponsor pro-voucher legislation at the General Assembly? No, this isn’t illegal. Yes, it actually happened. This is the type of behavior these same lawmakers decry about DC politicians. Also: Why is Mark Gill so interested in vouchers? A judge has denied a request from Metro Nashville Public Schools asking the courts to command Tennessee to fully provide education funding to local school districts. The district’s petition, filed Sept. 1, contends that the state’s constitution requires the Tennessee General Assembly to fully fund education in the state under its Basic Education Program. Commonly known as the BEP, it’s the formula the state uses to calculate how much it costs to educate an individual student in Tennessee. While the state has been sued for proper education funding, those cases didn’t request the courts force the state to immediately appropriate funds, Lyle said in the court papers. Therefore, Lyle said there is no law to enforce. “Such law must first be adjudicated before the writ can issue,” Lyle said. In short, until a decision is rendered on the adequacy of the formula, the state can’t be compelled to fund the formula. Lawsuits filed by Shelby County and Hamilton County both claim the state’s funding formula is inadequate and seek a judgment based on that claim. Those cases are still moving forward. Blogger TC Weber has some anger to share and raises some interesting and valid points about public school advocacy in his latest post. We all seem to be willing to work harder when there is a boogeyman to face. Charter schools make for a convenient boogeyman in the same way that the cartels do for the war on drugs – now before everybody loses their mind, know that I am not equating charter schools to drug cartels in any way but in their use as scapegoats. There wouldn’t be cartels in the illegal drug trade if there were no demand, and the same goes for charter schools in that there wouldn’t be charter schools if the demand wasn’t there. I do have to ask, though, what if the boogeyman is really us and our inability to provide equitable educational opportunities for all children? Case in point: have we expended as much energy in improving our schools as we have in fighting against their takeovers? Can we look at parents who are considering sending their children to a charter school and honestly say we’ve done everything to make the public option better? It is time to get beyond this single hot-button issue and focus on the inequities that exist in our schools. Weber has done his homework, analyzing current MNPS spending trends and highlighting some disturbing inequities. Read more about why he’s so angry. Governor Bill Haslam this week lamented school funding lawsuits while also admitting that Tennessee has a history of under-funding schools. “Now if you’re an educator saying, ‘Well, you’re not putting enough money in’ … you’re right, as a state we historically have not put enough money — but we’re changing that,” Haslam said. “But it’s kind of strange when we’re making historic investments in K-12 education, it feels like it sends the wrong message to do that,” he said. 1) Haslam promised in 2013 to make Tennessee the “fastest improving state in teacher salaries.” By April of the next year, the promise was gone. Additionally, the BEP Review Committee noted in its 2015 report that weighted average salaries in 2015 were lower than in 2013 as a result of the Haslam-Huffman elimination of the state minimum salary schedule. At the same time, the gap in pay among the highest-paying and lowest-paying districts in the state remains at an unacceptable 40%. Meanwhile, Tennessee suffers from one of the largest teacher wage gaps — that is, the gap between salaries paid to teachers and salaries paid to professionals with similar educational preparation. Attorneys for the state say Tennessee isn’t obligated to follow through with its own spending plan — and that Nashville doesn’t have the grounds to seek the order in the first place. 3) The state has a $925 million surplus as of the close of the 2015-16 fiscal year. That’s enough money to fully close the teacher wage gap and still leave more than $400 million for funding other important state projects. A more conservative approach would at the least meet the state’s funding obligations under the revised BEP formula, as Nashville is demanding in its lawsuit. From there, the state could phase-in further investment and do so without increasing taxes one cent. The current surplus comes after a year in which the state’s surplus topped $1 billion. During that budget year, Haslam and the General Assembly failed to adopt a salary proposal that would have provided teachers and state employees raises if revenues exceeded projections. They did, of course. So, while Haslam is saying the right things and while there has been some investment in schools in recent years, it’s not hard to guess why school districts are filing lawsuits to get the money they need. Bill Haslam is right. Tennessee has historically under-funded schools. But he’s leaving out an important point. The only thing that seems to get the attention of the state-level policymakers — and get money into schools — is a court order. The U.S. Department of Education announced $28.4 million in grants to 41 states and Washington, D.C to defray costs of taking the Advanced Placement (AP) fees for low-income families. The grants are used to help pay for students from low-income families taking approved advanced placement tests administered by the College Board, the International Baccalaureate Organization and Cambridge International Examinations. By subsidizing test fees, the program encourages all students to take advanced placement tests and obtain college credit for high school courses, reducing the time and cost required to complete a postsecondary degree. The grants included $362,985 awarded to the Tennessee Department of Education for the 2016 fiscal year, which means the department has already had the money and used it for students taking exams this past spring. More Tennessee students than ever before are taking AP exams and — more importantly — scoring high enough to become eligible for college credit. That’s key. One of our top priorities for the 2016-17 school year is strengthening pathways for students to be able to seamlessly transition into college and careers, and in order to do that, we have to provide more opportunities for students to earn postsecondary credit and industry certifications while in high school. Sometimes these opportunities carry a price tag that may prohibit some of our students from being able to attain the college credit and/or certification they could otherwise earn if they were able to afford to take a specific exam. And in Tennessee, we want every student to be as equipped as possible when they graduate from high school. The funding announced today provided exam fee assistance on Advanced Placement (AP), International Baccalaureate (IB), and Cambridge exams for about 4,000 economically disadvantaged students. Our friends over at Bluff City Ed announced this week they are saying goodbye. Jon even had a brief stint with us as his blog was transitioning. He’ll be keeping the content up – and there’s lots of good content. BCE started about 6 months after we started TNEdReport. Jon, Ezra, and the other writers were often my source for information on what was happening in Memphis. As Jon points out, Chalkbeat is here now, and they provide very solid coverage of the education landscape. But the insider perspective and the in-depth analysis from BCE will be missed. In the meantime, I want to wish Jon and friends well. A great blog that provided a great service — and one that will remain a great source of information and historical context.